These fish are beautiful! I currently have 6 lampeye tetras with a bunch of shrimp in my fairly-densely planted 20l tank; may I know if it would be advisable to add maybe 6 of these boraras to my tank? Would they get along with the lampeyes? 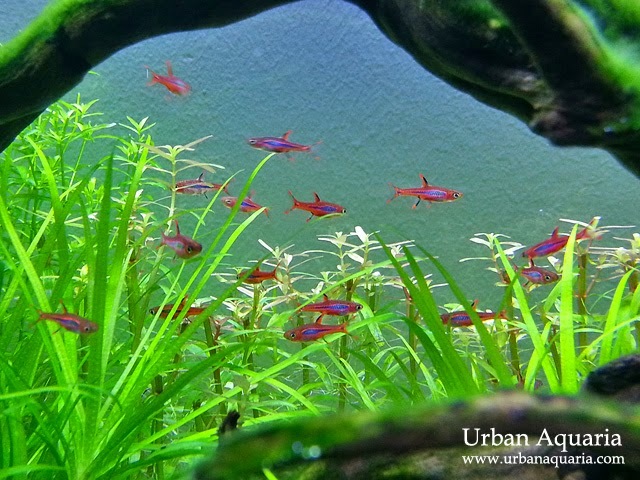 It should be okay to add a group of Boraras into your aquarium, the boraras themselves are peaceful community fishes... though do note that they are very small in size (ie. max. 2-3cm in length) so may sometimes get bullied by larger fishes. Lampeye tetras (Moenkhausia sanctaefilomenae) can grow up to 7cm in length, so i guess you'll just have to try and see if they can get along. Upon more research i think what i have is the Norman's lampeye instead of the bigger Moenkhausia Sanctaefilomenae. Would that make things better? Normans lampeye fishes stay relatively small too, up to 4cm size. They can live together with boraras in the same tank quite peacefully. That's great to know! I do weekly 20-30% water changes and I'm running aa Dophin H100 HOF (filtration rate 350L/H) with as much Mr Aqua ceramic rings as I could fit with filter sponge. Also, would you suggest Sera O-nip fish food for the lampeyes, boraras, shrimps and otos? I'm currently feeding my lampeyes hikari (fancy guppy) micropellets, the smallest pellet food i could find, but the pellets keep getting washed around by the current so I'm worried that the fish are not able to get the food and the food goes somewhere that is left to go bad and foul up the tank. Tried to look for the NLS Thera+ for small fish micropellets that you recommend, but couldn't find the Thera+ variant at the various Clementi LFS. Your filter setup and maintenance schedule should be sufficient. In addition, you mentioned that your tank is quite densely planted, so that helps alot too. Sera O-nip is a good food for those fishes, just that it can get rather messy breaking into bits and all the particles scattering everywhere. You could consider using a feeding dish or bowl to contain the food so its less messy and easier to clean up the uneaten bits. Its best to switch off your filter during feeding time to avoid the food particles getting washed around, make sure to only feed in small amounts at a time and let the fishes finish eating each portion before feeding more. The key is to not allow bits of food to drop into the substrate and get trapped there to rot. As for New Life Spectrum Thera+A Small Fish formula, its quite a popular food product so probably sold out at those LFS you checked. Either you could wait for them to re-stock or check at other popular LFS like Seaview and see if they still have stock available. I will look into the food options the next time I'm at the LFS-es.. Maybe get a floating feeding square thingy so the food doesn't scatter all over. I don't know if I have floor/surface space in my tank for a feeding dish though haha, what with the hardscape and the plants. One final question - aside from the increased garlic in the Thera+A formula, are there any other significant differences between that and the regular NLS food for small fish? Thank you again for your advice! Seems both have similar ingredient contents, just that the Thera+A formula has extra high concentrations of allicin (the major active beneficial compound found in garlic), which helps fishes to combat parasites and bacterial infections more effectively and also improve their immune systems too. Hi UA, it's me again. Just want to get your opinion/experience on Clown Killifish; i think they're absolutely gorgeous and was wondering if it would be a good idea for my tank. As it stands now I have 6 Norman's lampeye, 3 otos and a handful of cherry shrimps. But because the killies will mainly be around the top section of the tank, I would want something in the middle as well - the boraras. Is there a minimum number of clown killies to get so they feel safe/comfortable? Say, can I get 2-3 clown killies (1 male 1-2 females) to join the lampeyes, plus 6 boraras for mid-level inhabitants? If that, in your opinion, is going to be problematic and cruel for the fishes I will just have to decide between the two. Thank you again, you really are an invaluable asset to this hobby in Singapore! I've kept clown killifish before and they are compatible with the other small fishes too. 2-3 of them will be fine, but if possible more will always be better as they are usually more active in larger groups. Just keep in mind that as they spend alot of time hanging out at the water surface, there is a higher tendency for them to jump out of the tank if startled or chased, so you may need to use a cover to avoid that situation.